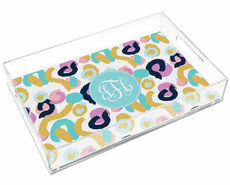 A crystal round tray engraved in your choice of monogram style. Your choice of 8", 10", or 12" round tray. 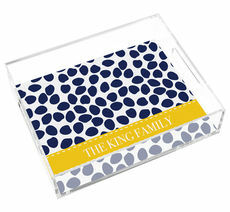 Home entertainers will appreciate the utility of these splashy serving pieces. 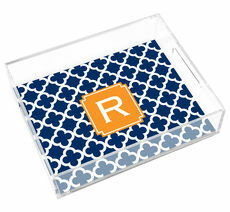 Color is..
Our personalized trays provide you with a lovely way to serve meals and snacks at a party or to enjoy breakfast in bed. 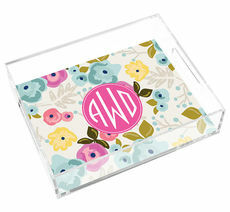 Our lucite trays are a durable option and are available in many colors and patterns from the trendy to the traditional. 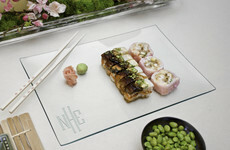 You can choose the size and shape of your tray including square, round and rectangular sizes. 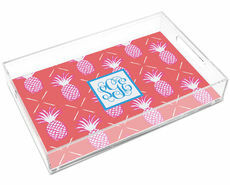 Our crystal serving trays are high quality and make a truly personalized gift in your choice of personalization style. 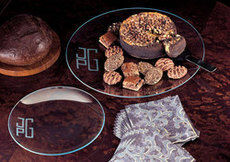 These are deep etched sand-carved products which are very high quality. 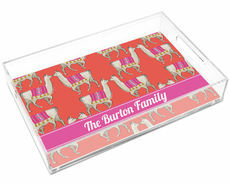 They make an exceptional bridal gift, anniversary present or holiday gift. 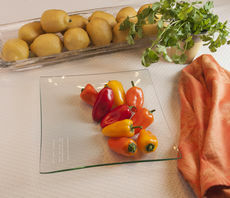 Home entertainers will appreciate the utility of these serving pieces. 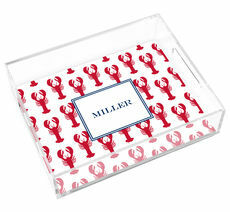 Personalized lucite serving trays are ideal for holding vinegars and oils on a table, serving treats to company, helping to clear glassware and other items after a dinner, and for bringing desserts to a den for a casual get-together. 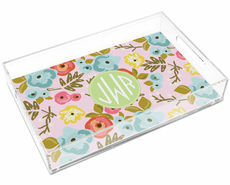 A serving tray makes an excellent place to display perfume bottles or to store makeup on a bathroom counter. 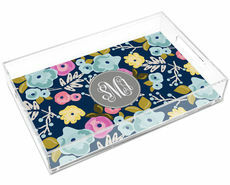 They are fantastic for outdoor entertaining as part of your serve ware. 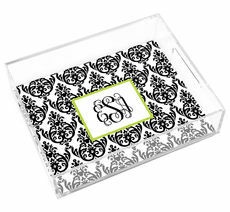 These sort of trays also make serving a breeze when bringing appetizers or glasses of wine or other drinks into your den for your guests. 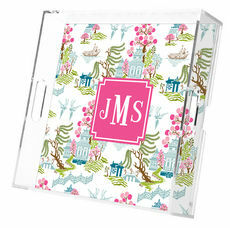 The presentation is pretty and upscale and the functionality will be appreciate when saving numerous trips back and forth from the kitchen. 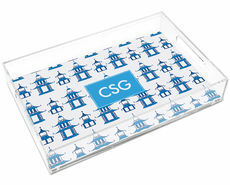 Trays can be placed on a coffee table, on a counter, and also on an ottoman as a serving tray. 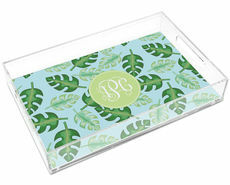 They make for a practical and elegant serving and storage solution. 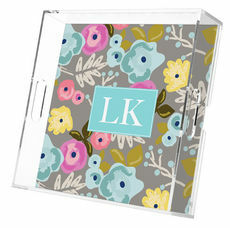 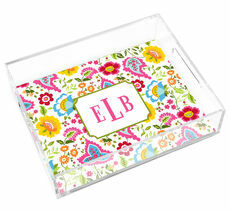 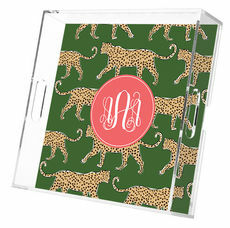 Personalized trays make a much-appreciated gift and are a beautiful wedding shower present, housewarming or birthday. 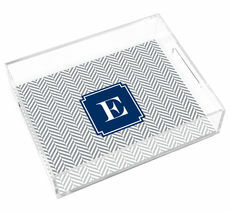 You can even add some pretty homemake baked goods on the tray, printed cocktail napkins or guest towels for an exceptional presentation. 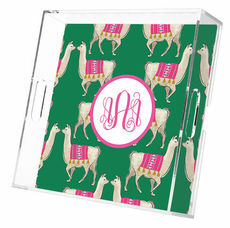 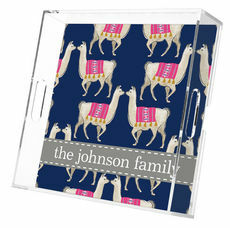 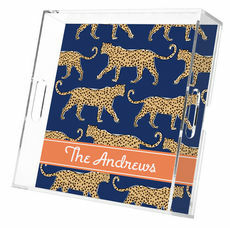 Alternatively, add a set of custom notepads or stationery and pretty pens then wrap it in cellophane for a truly impressive custom gift idea perfect for a birthday, anniversary, or holiday gift.